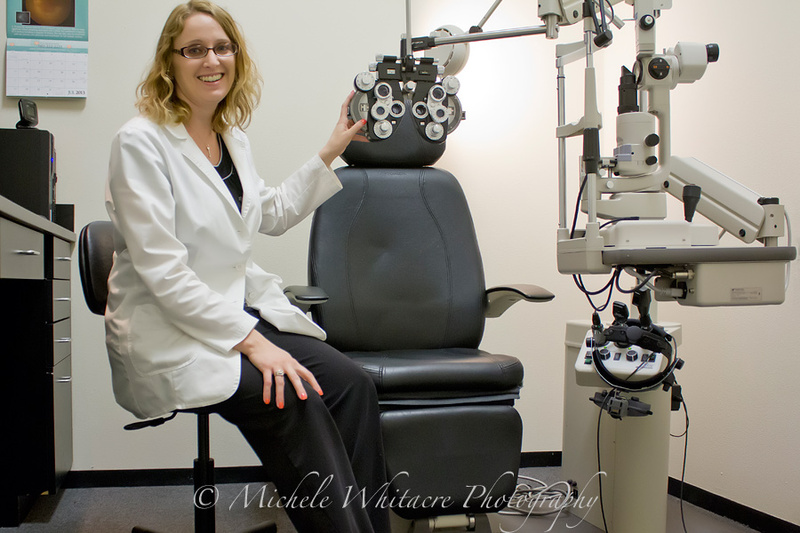 If you're stopping by for the first time you might not know that in addition to my photography business, I work part time as an optometrist. I work for a practice that employees multiple doctors at multiple locations throughout Arizona. Two of the local doctors have been off on maternity leave, and I agreed to help out by working extra days this month. Since I'm used to working only 4 days a week, the 5 and 6 day weeks just about did me in! Since most of July was consumed with working, I decided a photo of me at my optometry office was fitting for my self-portrait this month. It also felt fitting because after working at this office for the past year, I am soon going to be changing locations and this photo will be a good future reminder of where I spent the past year. I thought about straightening my hair and trying to look all purdy for my photo, but then I decided doing that would make the photo a big fat lie and I didn't want that. I'm trying to stay true to my reality as much as possible in these images, and the reality is that it's July in Arizona and it's hot, hot, hot! So I'm not about to spend an hour blow drying and straightening my hair unless absolutely necessary, so my natural wavy mess is my hair style of late. I have to admit that this isn't going to make it into my list of favorite self-portraits, but sometimes that's just the way it goes. I didn't want to cause a disruption to the office so I didn't drag my tripod in with me. The best I could do was to place my camera on a stool, but it was a little lower that I would have preferred. Oh well, the point is to capture the month and that I did.